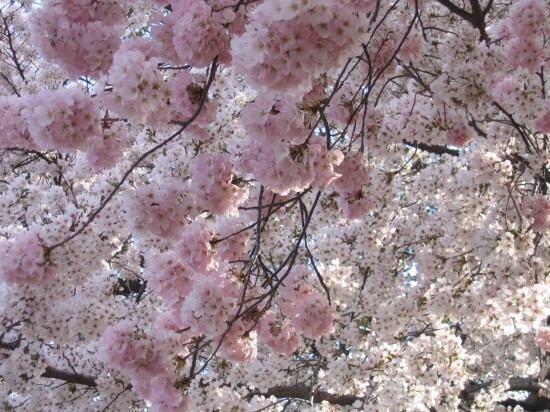 Yesterday marked the last day of the National Cherry Blossom Festival here in Washington DC, an annual two-week event that celebrates the blooming cherry trees that encircle the city’s Tidal Basin. Originally a gift from Japan in 1912, the trees still stand for the enduring friendship between two countries. All being well (though some years nature doesn’t respond to deadlines), the blossoms are at peak bloom for the Festival, ready to receive thousands upon thousands of resident and out-of-town visitors, wanting to witness the spectacle. At times, the Tidal Basin becomes too crushed for comfort, with people pushing against each other, cramming into a spot beneath the delicate branches, but if you can find another time to go, the effect around the water is truly magical. The best bit for me is how the trees make you focus on color. At every stage of their development, the cherry blossoms unfurl through a gamut of glorious shades. First there’s the hot punchy pink of the buds about to burst into bloom, which gives way to the softer pastel shades of the full flowers on the tree. At their final stage, the fragile fluttering to the ground of loosened petals has the effect of a snowy mantle shedding softly. One artist in particular who would have reveled in this riot of pink petals is the Frenchman Henri Matisse (1869 – 1954). He was the founder of Fauvism, an early 20th century style of painting in France, characterized by fierce and expressive color. In the years leading up to this breakthrough, Matisse despaired of ever making a living from his art. While completing his law studies, he’d enrolled at the Ecole des Beaux-Arts and went on to paint with various other artists, experimenting with different styles and palettes before producing his seminal painting Luxe, Calme et Volupté, which forged the path of Fauvism. Fauves is French for “wild beasts” and was coined by a disapproving art critic at the first Fauve exhibition in 1905. 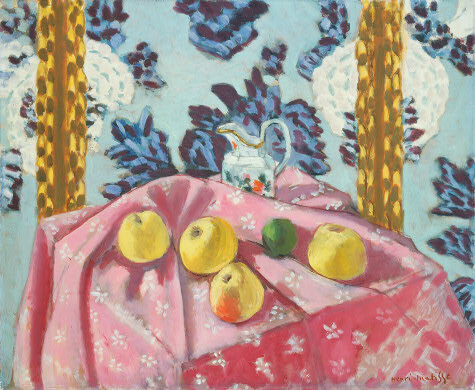 But despite doubt surrounding what he was doing, the NGA’s Still Life with Apples on a Pink Tablecloth (1924) shows how Matisse stuck with his search for balance between color and form. 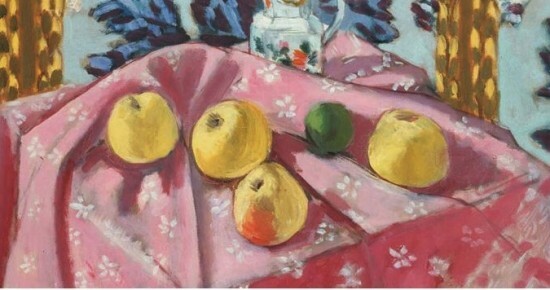 This fulsome and fervent composition, with fruit on a table and a screen or curtains behind, reflects the artist’s intention that “the entire arrangement of my picture is expressive.” Indeed, no part of this is more important than another, with background, foreground and sides united in a frontal plane of kinetic display. There’s shading (suggesting depth) on the cloth and fruit, and the table is set at an angle that encodes recession, but the general flatness and intensity of color create overall visual immediacy. The mustard/ yellow vertical bars behind the table give balance of color and form against the horizontal table block, while the curved fruit forms stand against the lined edges of the table. The way Matisse has mixed bright colors, shapes and smaller motifs (like the pattern on the cloth or the jug behind) gives the composition a strong sense of rhythm and movement. How quickly are those cloud-like patterns scudding across the back wall? As the first abstract art movement of the 20th century, Fauvism was “the foundation of everything”, leading painting into wild and unchartered territories. But as with so many of life’s loveliest things – including the cherry blossoms adorning DC – Fauvism proper was over in a flash, lasting only from 1905 – 1907. 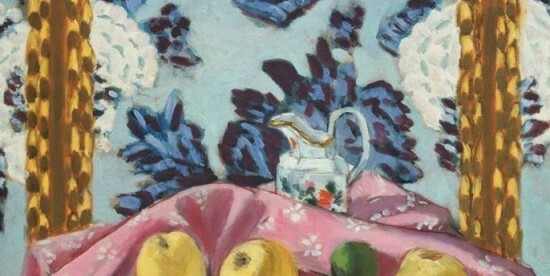 Luckily, Matisse maintained his interest in color and form for the rest of his career, so if those pretty pink petals passed you by, fear not: this tablecloth will bloom all year round.